I hate writting comments about my pics. but i have to do it. This is a wall i created long time ago. First i created the background, the bg its like a little representation of the sky or heaven (in spanish sky and heaven means the same). 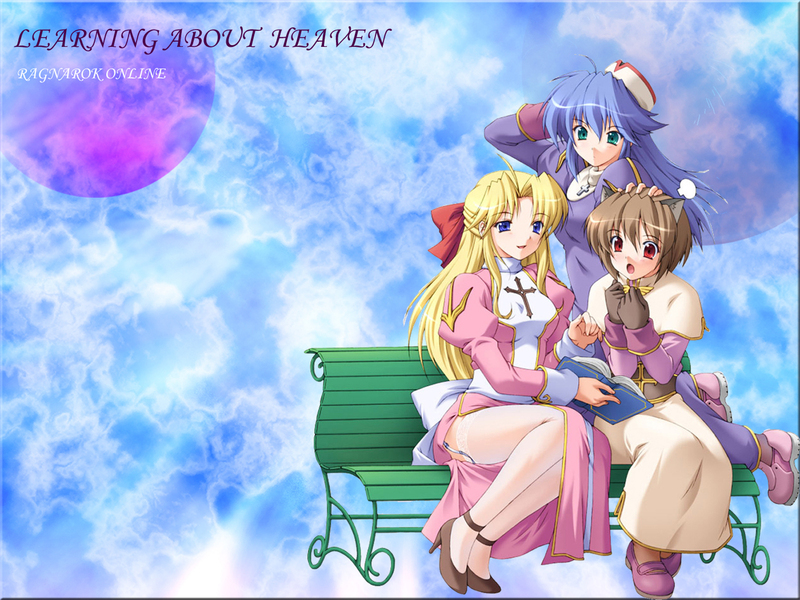 I used this bg in another wall, but then isee this scan of three characters of Raganarok (A priest (purple haired), a high priest (blond haired) and an acolyte (brown haired)) I used like 13 layers, and bla bla bla bla. I think this wallpaper is very pretty! ^_^ I really like the unique set up and the background inside the wings ! great scan bro! adding 2 faves! Well, heaven and sky indeed mean the same thing in Spanish but heaven also mean, gloria or paraiso so if someone know Spanish then there is no problem, good wall but I didn't like that bench. SO KAWAII! I think it's a beautiful pic filled with... err... ... beauties! Thanx 4 sharing it! This is definitely worth spending at least a few credits. This is also worthy of being saved as "wallie !" on my LCD screen. Thank U ! the backgroud is very nice and the girl is awesome. good job.. thanks for sharing..